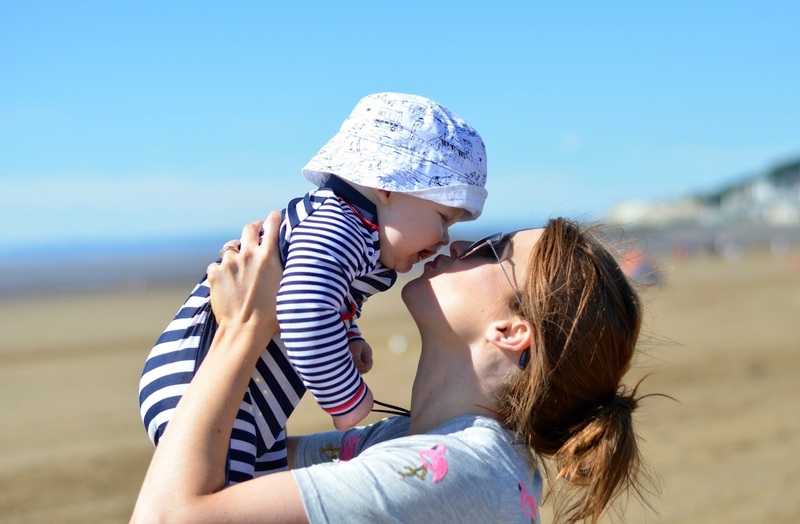 As a family, we love to visit different places but with life being quite chaotic really since we had Little L back in January, we really haven't had the time or energy to visit many places. It's something we enjoy so much though; when we have taken LO away previously, we have always found that he's come back just a nit more grown up than before, and we love making memories in new places. We are also very fortunate that we have immediate family who live in some beautiful parts of the world, and so it gives us a great excuse to get away from home occasionally, and head off in the car somewhere new, even if just for a few days. A couple of weekends ago we planned a long weekend away to Somerset. Mr F's sister lives near Bristol and my sister in law on my side of the family lives in rural Somerset, so we decided to have a few days down there to visit and to visit this beautiful county. We set off on our long journey from Yorkshire on Friday (it took us around 8 hours with stops and bad traffic) and arrived early evening at my sister-in-laws house where we stayed for a couple of nights. 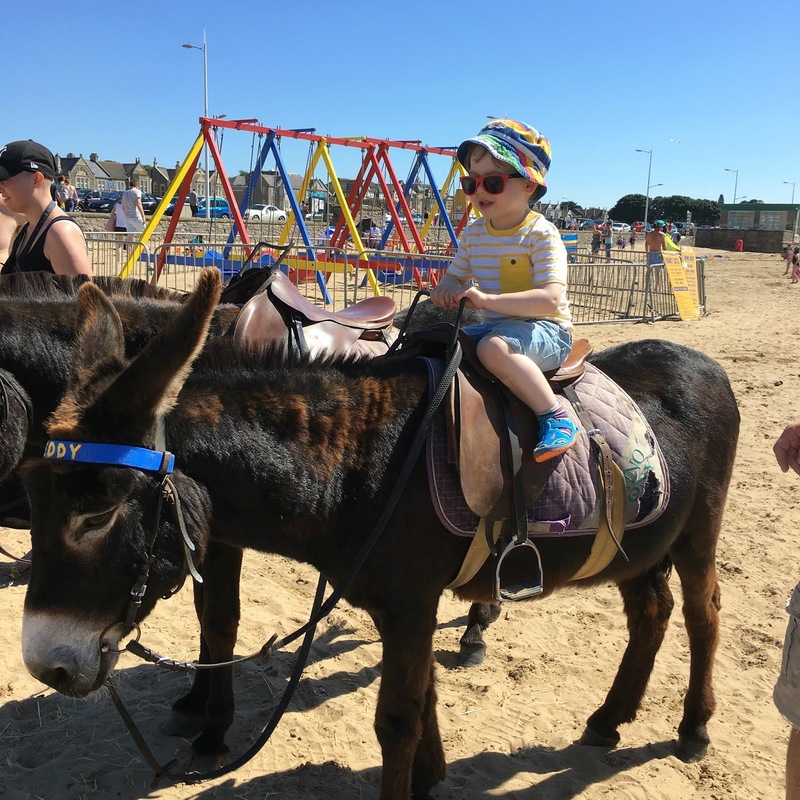 On the Saturday we headed to Weston-super-mare for a traditional day at the seaside. 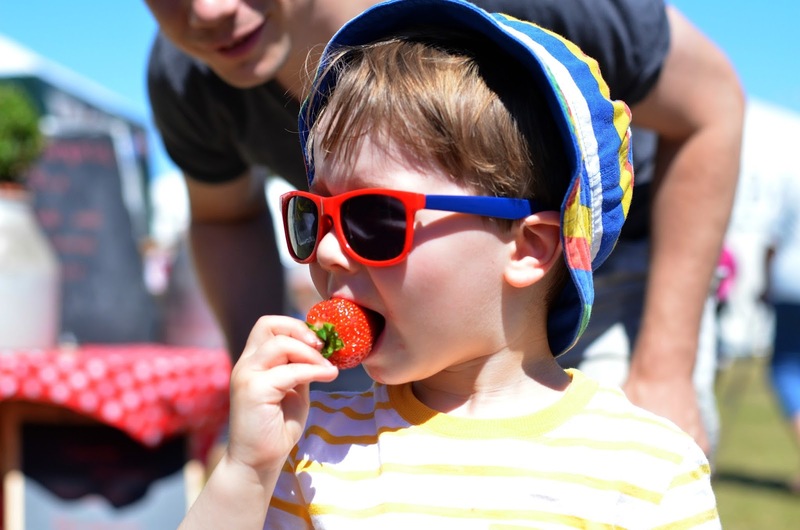 We picked a great day to go, not just because of the sunshine, but because there was the Weston Dairy Festival on the Beach Lawns, so we spent the morning having a little look at the livestock, craft stalls and trying out all sorts of locally produced tasty treats and snacks. 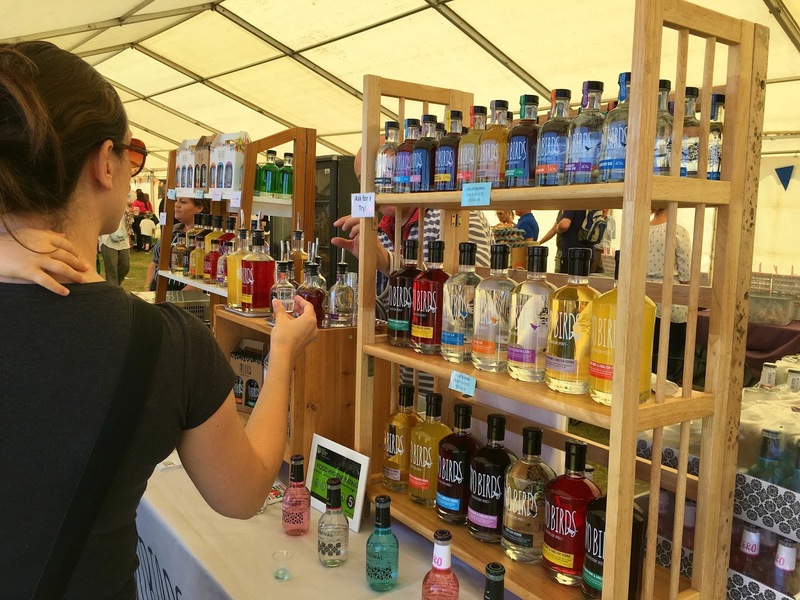 There were all sorts of interesting stalls to look at, with lots of free samples too, from locally made drinks like Somerset cider, to cheese, cakes and sweets and locally produced fruit. We didn't spend that long there as it was so hot inside the tents but you could easily make a whole morning of it. 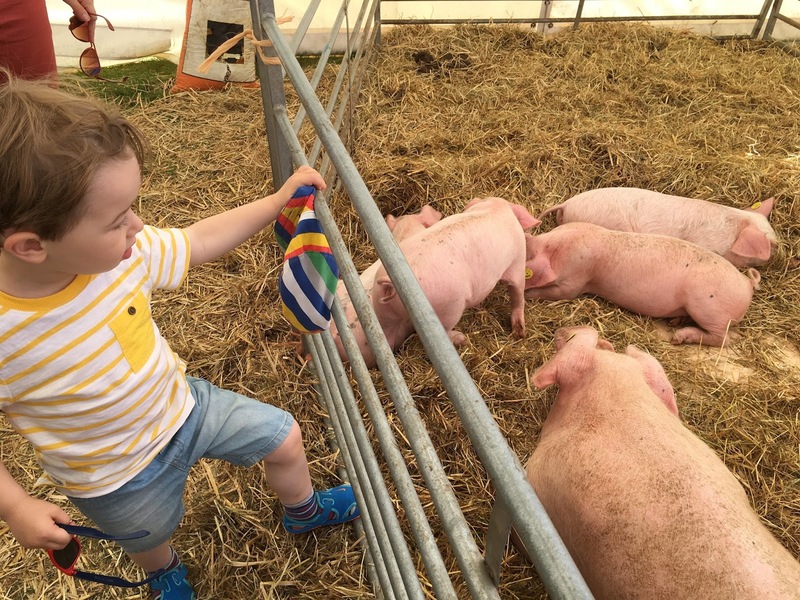 There was lots of livestock for children to look at, like this mummy pig with all her cute little piglets. After spending a couple of hours at the Dairy Festival, we headed for lunch and had the most delicious melt in the mouth fish and chips at Winston's Fish Bar on the promenade. The food was incredible! 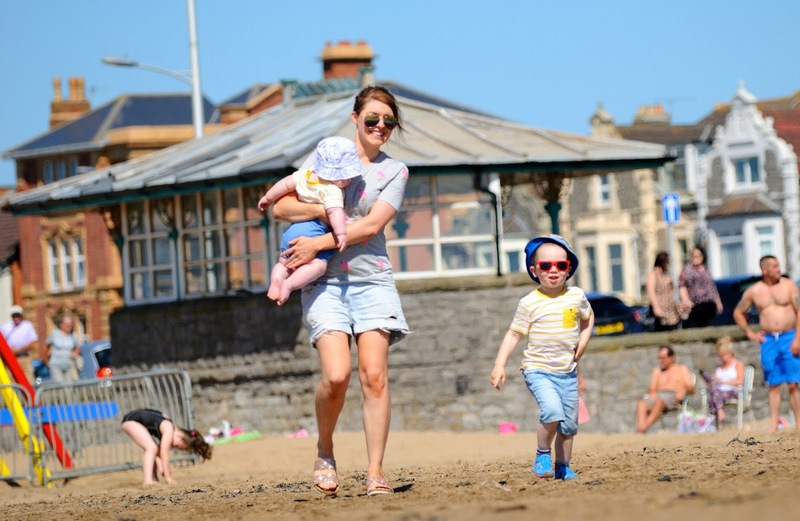 We of course went to the beach armed with buckets and spades. The tide was out the whole time we were on the beach but there was plenty to do even if we couldn't splash in the sea. 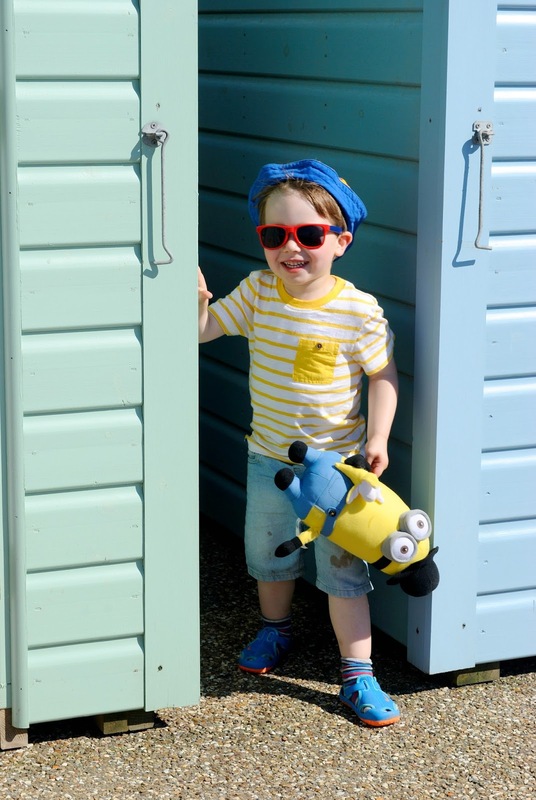 It's felt like ages since we have been to the seaside in the UK and in the sunshine too. 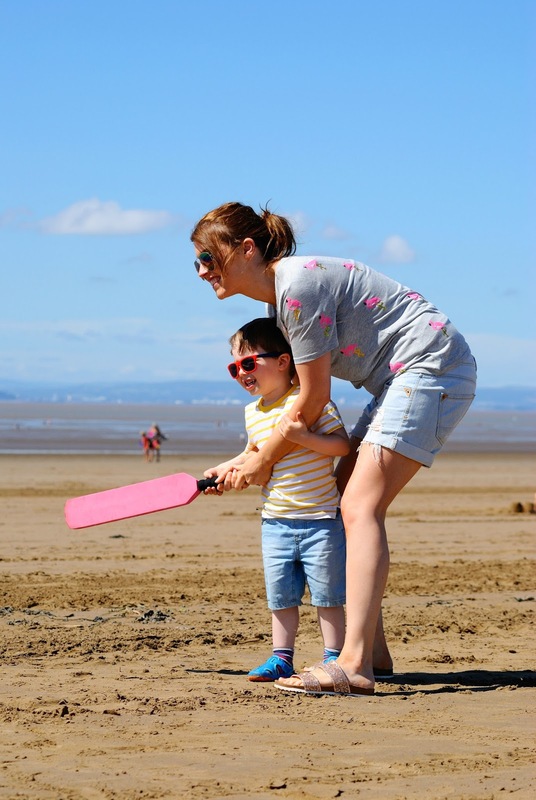 LO had a great time with his auntie and uncle playing cricket and building sandcastles. 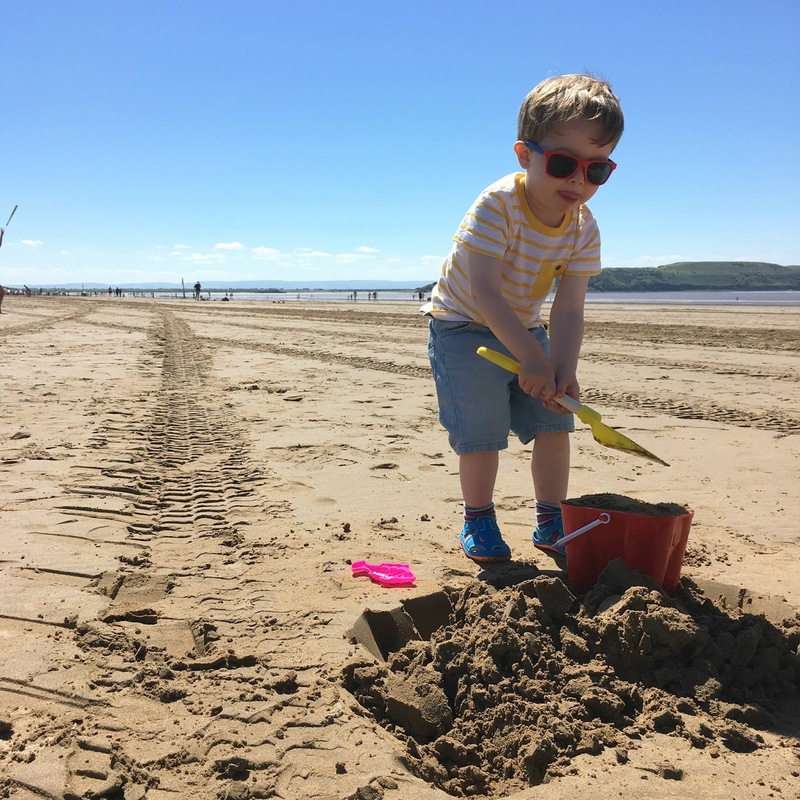 It was Little L's first trip to the seaside and he was more interested in eating sand than anything else, so we kept him busy with a little digger toy. LO was just happy being his usual energetic self, running about with the wind in his hair and the warm sun on his skin. 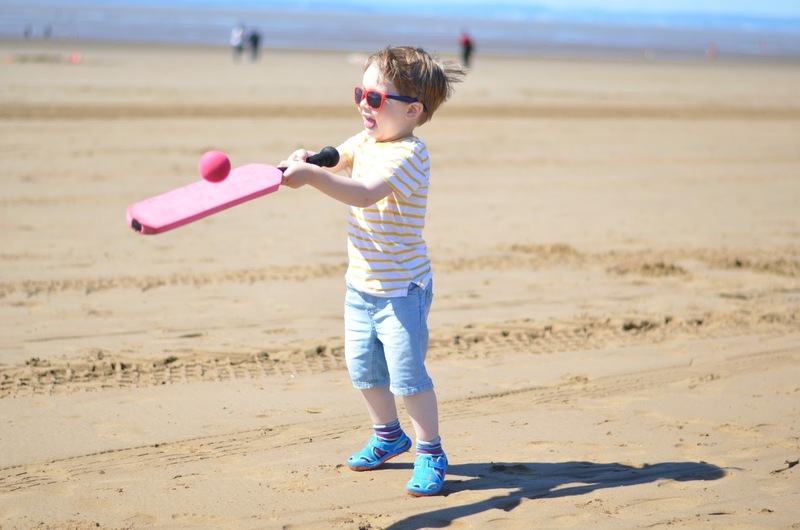 LO has got so good at hitting a ball with a racket or cricket bat lately and most definitely takes after his daddy with his love of sports. Even though it was a really, really long journey for us from Yorkshire down to Somerset, it was so worth it as we got to see family on both sides (Mr F's sister and her husband and also my brother and his wife) and we finally got to have some much needed time to just relax and enjoy the sunshine. I love this photo of me having a walk with my two little cherubs which my sister snapped while we weren't looking! 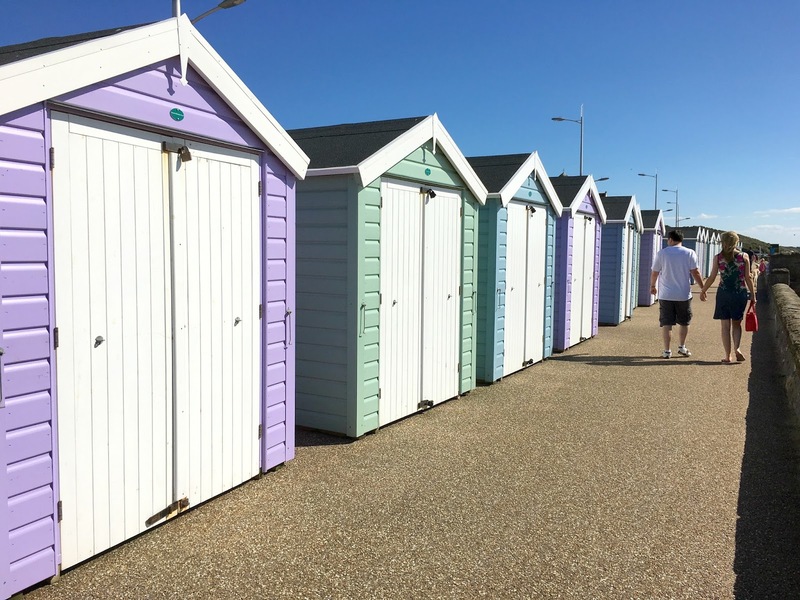 As soon as we arrived in Weston-super-mare, I spotted these rows of pretty pastel coloured beach huts, which were all lilac, turquoise and powder blue. They looked so pretty against the bright blue sky and we of course had to pose next to them/play hide and seek in between them. Unfortunately we didn't have long so we jut snapped a few on our phones. LO was so busy playing hide and seek but it was unusual for us to capture a shot with just Little L and not LO. 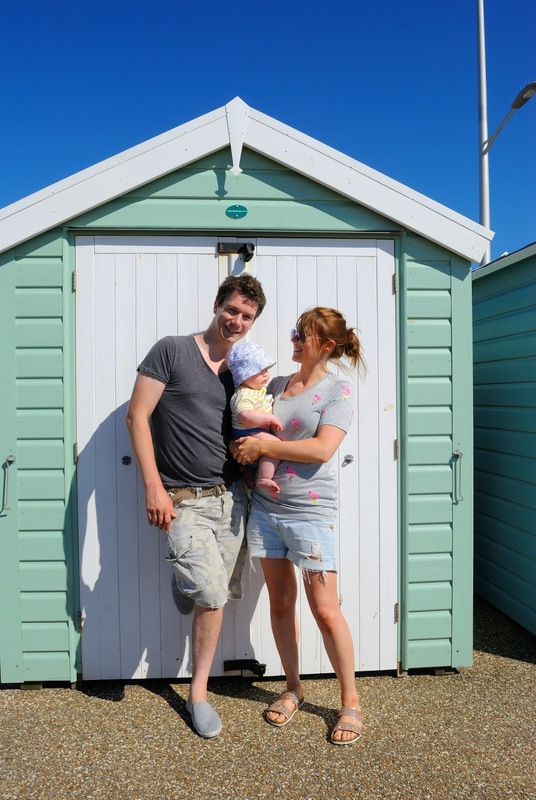 At exactly 7 months and one day, this marked Little L's first ever trip to the beach. He seemed to really enjoy the sunshine and to just sit and watch what was going on around him. 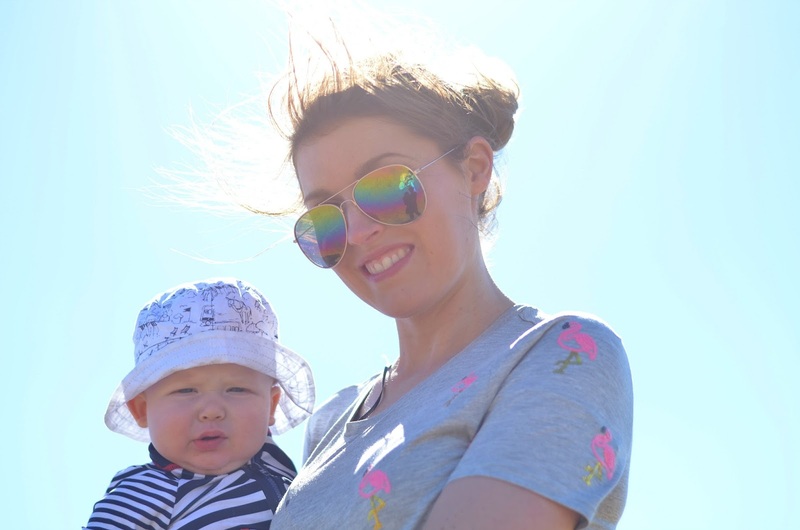 I love the first photo of me and my littlest- and unbelievably, he is wearing the exact same UV suit that LO wore to the same beach when he was 10 months old. I love his little t-shirt he wore- it's one I got in Mothercare and has a seagull on it saying 'squark'. It was good practise taking Little L to a beach in preparation for our holiday to Rhodes in September. It was quite hard work keeping him from eating the sand and his little creases were just so full of sand when we got home in the evening. A rare impromptu photo of the four of us where we haven't had to use self timer or prop the camera precariously on a bench. 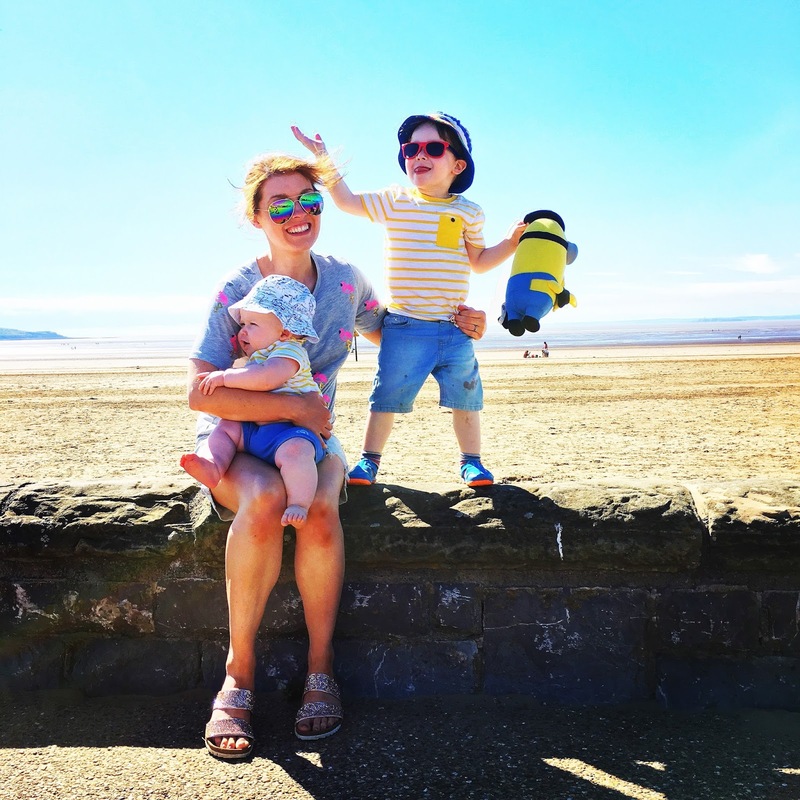 We had such a lovely day at the seaside and all came back a little windswept, covered in sand and full of fish and chips and ice creams. But those really are the best kinds of days at the seaside aren't they?